Further to the west is another portico. Once again you must climb a small staircase or ramp of rising about five feet under the portico. Now you are just outside the temple proper. Only someone pursuing their true will can pass beyond this point. Notice before going any further, the symmetry of some of the images, again remind yourself of opposites that need to be reconciled. Here are images of Horus and Seth, shown in a unified form. 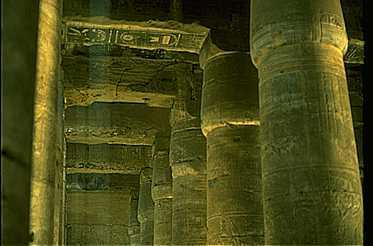 Prepare yourself and move through the central doorway into the dark interior of the temple. You are confused. Everything is dark and you are in a labyrinth or forest of closed papyrus pillars. Strange noises, sights, smells and sounds assail you. Sometime a shaft of light or a flickering flame illuminates a particular images, try to remember this and record its meaning later.